Will the real 3rd Umpire please stand up? | My Way! Now that’s a job I would want to apply for. The Venerable 3rd Umpire. The only person I know who has an easier job than his, is the bloke sitting next to him; yup the 4th Umpire. But I digress, this post isn’t really about how being a 3rd Umpire is the best job in the world. Nor is it about that blighter who sits next to him, its about all this controversy around UDRS and how perhaps this 3rd Umpire (the Venerable bloke) can actually make all the difference. I think it makes sense to centre every argument around data. In the World Cup this year, on an average a total of 25 percent of decisions referred were changed after empowering the 3rd umpire with technology. A total of over 50 decisions were over-turned – some crucial ones like Tendulkar’s which could have potentially changed the result of the tournament in itself. Refer to this for a datapoint – still looking at data for the whole World Cup but I’m projecting the data since I remember that if anything, use of UDRS and successful overturning of decisions only increased. Was it a success? Of course it was a success. The ICC got 50 decisions more right than it would have otherwise, that’s exactly 1 decision per match (49 matches in the World cup). And that’s not important enough? One potentially game-changing decision every match – ofcourse its important. Regardless of cost, gender, breed, financial pawar (pun intended) and everything else. And when I say DRS, it needs to be everything – Hawkeye + Hotspot + Snicko + Super slomo. If all of these can’t be made availble – it needs to be Hawkeye + Snicko/ Hotspot +Super Slomo or whatever slomo is available. This is more than sufficient – hawkeye though is key. Which in my view is extremely accurate – people must realize it only predicts the ball path on the basis of a projection of the existing ball path. If this technology doesn’t work for cricket balls bowled at 140 Kmph than how come the defense continues to use this for missiles launched at over a 1000 Kmph? You can read this for more information on how Hawkeye really works. I understand that the ICC doesn’t want to take this cost, and its extremely expensive. I also understand that there could be a situation where the full DRS might not be used in every location. Hell, its still way better than what’s going on right now isn’t it? I think DRS can learn from the start-up world for this. If a mobile app company for whatever reason can’t provide the same experience on every handset, it doesn’t mean it shuts down the app itself. It ensures that the app is so tweaked that whichever phone a user accesses it on, desired value is delivered to the user. So half UDRS, Quarter – whatever it is, let’s go with it. It’s still better than what we have. And that’s all that really matters. Whichever way you slice it, any of the 4 UDRS technologoies when used by the 3rd umpire will only aid his decision making. In terms of big inside edges, big nicks – in most cases he doesn’t even need any of the tools; all he needs to do is watch it on the tele once again. Most of the big boo boo’s are made for inside edges and with DRS this can automatically be eliminated. Instead, what we have is perplexing situations where everyone except the 1 umpire who gave the decision knows that its the wrong one and nothing can be done about it. It’s like watching a man drive his car off the cliff owning all the required tools to warn him and bring him back onto the road if he slips into the abyss, but doing absolutely nothing about it. That poor man is the Umpire. Just ask Umpire Erasmus if you don’t believe me. The other big debate is on how it should be used if it is infact used. Currently, the onus is on the players to invoke it and take the Umpire on when he so feels. My personal view is different, in my view ideally the umpires should step in and do their job. After all, that’s what they’re paid to do right? After the decision has been made – all he needs to do first is call the umpire and say hang on, “I want to check that, give me 2 mins.” He then comes back with his decision while the players wait just like they would otherwise. If there is no need for it – no radio and life goes on. 2. The 3rd umpire starts earning his fees. He’s had a free ride for far too long anyway. 3. He becomes the powerful virtual umpire / auditor and his role becomes as important as that of the 2 on-field umpires. And why not, all 3rd umpires are ICC empanelled anyway. 4. Yes, sometimes hawkeye gives far too many people out not because the technology is flawed but since it doesn’t factor in the historical benefit of doubt to batsman given over the years. Therefore, putting a human element there will ensure that technology is not followed blindly. Historical allegiances will still be respected. 6. Another argument is that the role of the on-field umpires becomes redundant. Well – not true. If they do a good job decisions won’t even go up. Secondly, the broad ideation behind DRS is to ensure we get more decisions right. If that removes a little bit of power from the Umpire’s quarters. Than really – so be it. Also, really the ICC’s allegiance is to its players and making cricket a better game, not to ensure that umpires have enough work satisfaction. This could well be the best strategy. As of now, the rules are completely ridiculous – DRS for LBW’s if India is playing, different rules if India isn’t playing , different rules if ‘Pawar’ is asleep. Let’s make the game simpler. · The ICC is in a confused state on this. Employ it completely for some series, partially for some… In the process they have confused the Public and most certainly a few cricketers as well. Not to mention the internal conflicts on opinion within the governing body (u briefly touched upon). In other words…. Would they sit up and take notice to valuable suggestions at this point…. Appears doubtful to me! The technology is actually very robust. All the swing and all that actually doesn’t even matter – this is because it simply projects the actual ball path on the basis of what has actually happened. We’ve seen the ball change its course after passing the batsman and before it gets into the keepers gloves. But have you ever seen the ball change its course mid air after pitching. Please note – not after pitching but mid-air after pitching before it reaches the batsman. I haven’t. While factoring in the projectile..everything is factored in swing, weather, speed, air density..all of this simply because its learning all of this from the actual ball that has been bowled. In either way – we’re better of getting one wrong thanks to technology rather than 10 wrong because we don’t have it. This is the key stat and no one seems to understand this. I’ve played cricket at school/college and club levels…and I know how hard it is when a wrong decision is given against you..and the consequences of a bad decision are far far greater in international level cricket… so, I do agree that there is a need to use some kind of a corrective action using technology. ICC and BCCI are at fault for making a mockery of the DRS issue… at a time when cricket needs to make that big push to garner a larger audience, this is disconcerting even for people who love the game already. But handing over the reins almost entirely to technology will surely rob the game of it’s magic… Football, basketball all have the same issues…but there the on-field referee calls the shots… If frenetically-paced contact sports watched by billions of fanatics can do with limited technology, so can cricket. The FIFA chief is also under pressure to infuse more technology, but that’s because he’s yielded very little…they’re resisting the use of goal-line technology for god’s sake! Whereas the administrators of cricket have yielded a lot more and are now seeing that there’s no end to it. While this process is already on, it needs to be made more efficient… and there has to be greater political will amongst the cricket boards of different countries to arrive at a consensus… political will – many have realised – is the need of the hour to end the malaise even in governance and many other arenas. So it isn’t overtly idealistic to aspire for it in cricket. Remember the use of technology will slow down the game inevitably, no matter how quick the third umpire is…and it has the potential to turn off people in this age of ever shortening attention spans. Let’s try to let the game be played according to the laws of the field… it has an innate capacity to establish greater order and harmony. 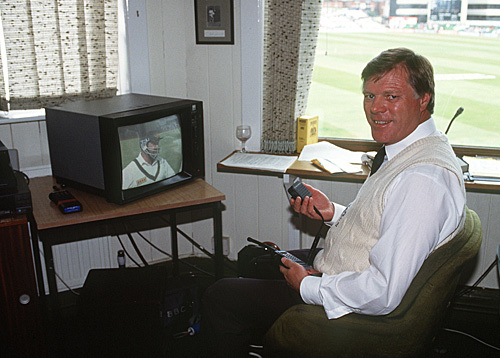 Else, we better make video game charachters of all our cricketers and let them play the game on on a screen using a joystick/controller…that way there is no error possible. Enjoyed your comment. Would like to correct you on a couple of points though – what I’ve suggested is exactly what is used in American Football today. And no, it hasn’t robbed the game of any of its ‘magic’. No – Super Bowl ‘Ad rates’ haven’t dropped. Also – I think you’re missing the point the little. It’s not really about the Wii generation (that generation infact hardly watches Test Cricket), its about using technology to simplify life. That’s why we use the mobile phone or the automobile – else we can easily send telegraphs and walk to work. If your logic is true – then why not drop the 3rd umpire for run-outs as well? Train the umpires and make them better at it right? On harmony…I think there is more disharmony if wrong decisions are given out over and over again. If life is fair game, then level of harmony itself diminishes. On the romance involved with Test Match Umpires, I agree with you. But in every facet of life…Romance diminishes and real ‘value’ superceedes it. If that wasn’t the case, the Volkswagen ‘Beatle’ would be the most in-demand car today. Sad Truth, it isn’t. Not even close. After the decision has been made – all he needs to do first is call the umpire and say hang on, “I want to check that, give me 2 mins.” He then comes back with his decision while the players wait just like they would otherwise.- Good Idea…. Its Stupid- But thats the way it is -Ideas and Things that SHOULD be Implemented immediately…just do not see the light of the day…do not happen….Either due to Vested Interests or….Just Inaction…. Until the year 2000, the Union Budget was announced at 5 pm on the last working day of the month of February. This practice was inherited from the Colonial Era, when the British Parliament would pass the budget in the noon followed by India in the evening of the day. Imagine !!!! And we say we got Independence in 1947?????? …not getting the word…to describe …Inaction?? no,,,pl help with the word…thanks !! Love your article….Love Cricket too !!!! Sehwag- The One Man Army?? Sm…absolutely love your comment. Unfortunately, the people who can actually make these changes are some of the most inept people in the country. And the structures and heirachies are so convoluted that only those at the helm understand them. That’s the true barrier to entry. A change is on it’s way though. Keep your ears perched. ..Oh and about Sehwag “The One Man Army “…there’s always another Test? I like the current model with one change – me thinks there need to be 2 umpires who sit in isolation, and ONLY if BOTH vote to overturn the on-field decision, should it be overturned. That way we will hopefully have a situation of two umpires reviewing the replays independently and catching the obvious mistakes.